This unique boutique hotel enjoys both lush, tropical gardens and the white sandy shores of the Pacific ocean due to its fabulous beachfront location. Capitán Suizo is open from November 1st to September 15th. This unique boutique hotel enjoys both lush, tropical gardens and the white sandy shores of the Pacific ocean due to its fabulous beachfront location. Each unit is surrounded by beautiful plants and flowers and all are ocean facing. They have a balcony or terrace to take-in those spectacular ocean views. The spacious rooms have king size beds and are furnished with local materials, enhanced by local artefacts and antique photographs. The ocean views provide stunning sunsets but also cooling sea breezes which can be enjoyed by opening the sliding doors to your room. Unlike some areas of Costa Rica, the sea here is safe for swimming, and it’s easy to while away the hours on the sandy beach just in-front of the hotel either sunbathing or partaking in water activities. Why go to Hotel Capitán Suizo? 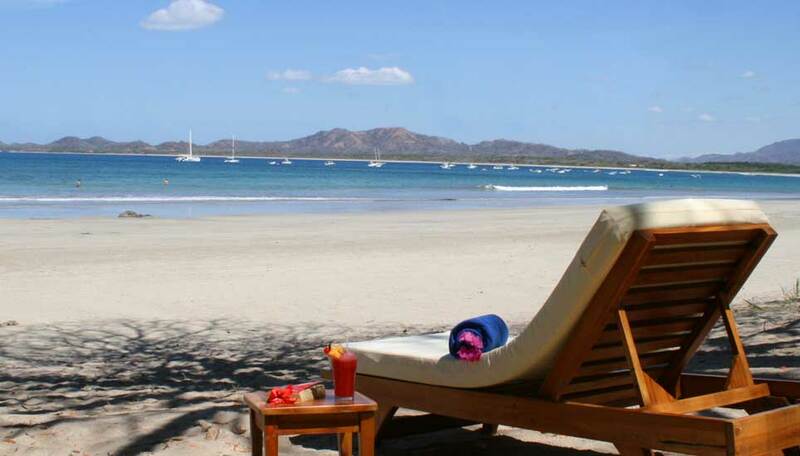 This is one of the most charismatic Costa Rican beach resorts, the perfect spot for a romantic getaway. Nature lovers can enjoy being surrounded by flora and fauna while having the facilities of a beach town within walking distance, Capitán Suizo is ideal. The hotel is located just outside of the village, at the end of the bay and right in front of the ocean, guests can enjoy the warm waters all year round. The water here is safe, swimming, surfing, kayaking and other water activities are popular and available right in front of the hotel. 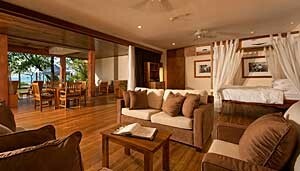 This is the place to relax and soak up the Costa Rican sunshine. Should you wish to venture further afield, the hotel can organise tours to nearby attractions such as the Palo Verde National Park or Rincón de la Veija. 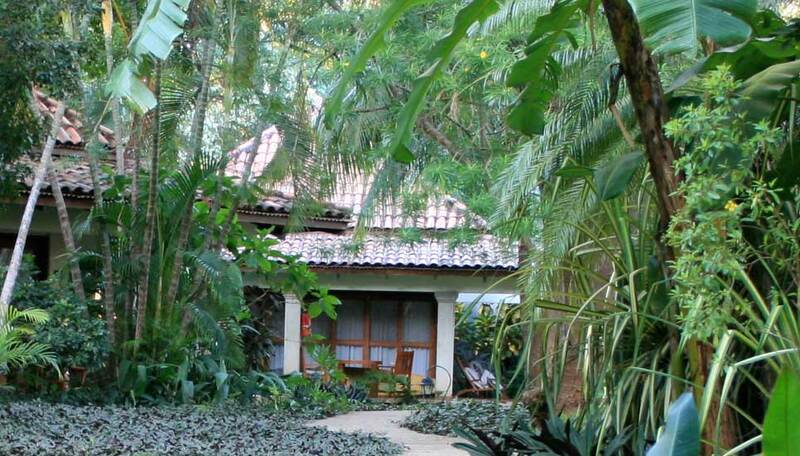 The hotel is nestled between lush, tropical gardens with a wide variety of native trees and abundant ornamental plants which attract diverse wildlife. The grounds are the perfect place to observe a myriad of different creatures that call Costa Rica home. Beautiful birds, howler monkeys, squirrels, gray iguanas, green iguanas, porcupines, geckos, armadillos, skunks, frogs, raccoons and anteaters are just some of the animals that can be seen almost daily throughout the hotel’s colourful tropical gardens. • Swimming, kayaking, surfing, boogie boarding • Turtle tours (during season) • Guided boat tours of the estuary • Horse riding • Canopy tours • Quad bike tours • Snorkelling • Scuba diving • Sailing trips • Tours to the nearby national parks. Children are welcome. There is a babysitting service. The restaurant has children’s menus. Some superior rooms have inter-connecting doors for families, bungalows have a queen size futon. There is complimentary WiFi in all rooms as well as internet service in the business centre in the reception area. 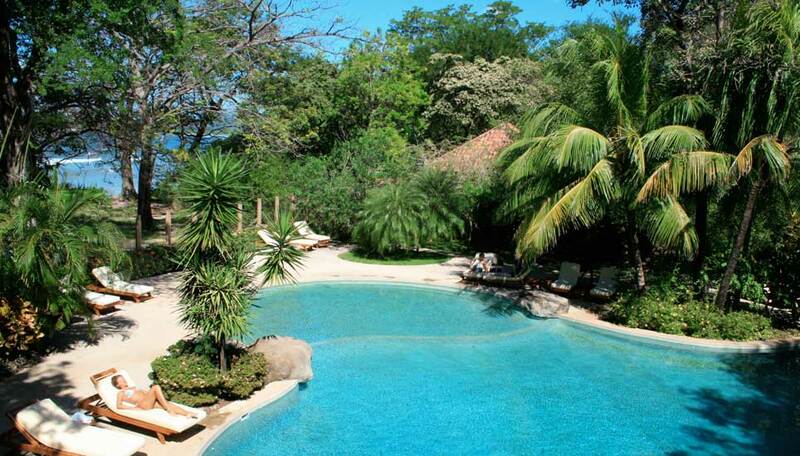 Hotel Capitán Suizo has 6 bungalows, 6 ocean front units, 22 superior rooms and 1 four-bedroom suite. Superior Rooms. There are 11 ground floor superior rooms and 11 located on the first floor. All have a terrace or balcony where you can relax in private. Bungalows. 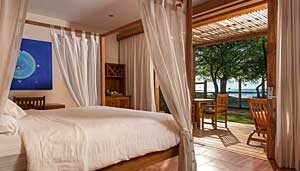 Each bungalow is nestled in amongst nature with a large terrace complete with hammock. The spacious bathrooms have a whirlpool bath and an outside shower with hot running water. Suite. 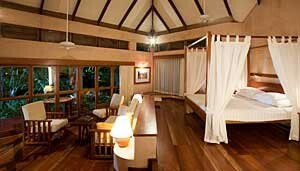 The four-bedroom suite is on the second floor of the main building and looks down over the lush tropical grounds. Each room has air-conditioning, a telephone and safety deposit box. One room has a king size bed, one a queen size bed and two rooms have twin beds. There is also a spacious living room. The huge balcony has a hammock and the two bathrooms have double sinks while one has a Jacuzzi and shower, the other has a shower. Beachfront Garden Rooms. 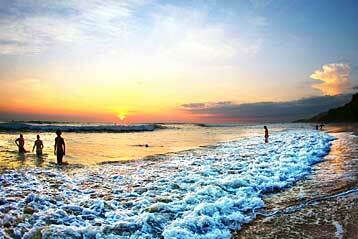 These rooms are situated on the ground floor and both have spectacular ocean vistas. The spacious bathrooms each have a shower and a jacuzzi. Wide sliding doors open up onto a contemporary, tropical terrace with a wooden deck which offers an amazing ocean view that can be enjoyed while lying in the hammock. Beachfront Suites. With a breath-taking oceanfront location, direct access to the beach and a spectacular view to the Pacific Ocean, the Beachfront Suites are both spacious and cozy. 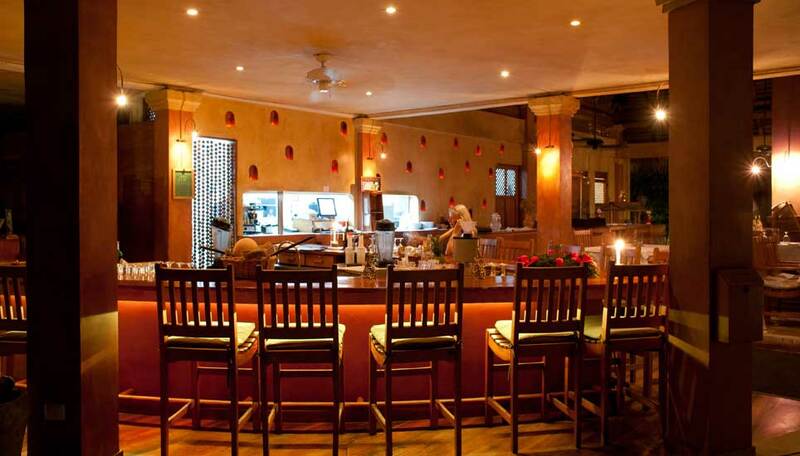 They offer a comfortable living area and spacious bathrooms. 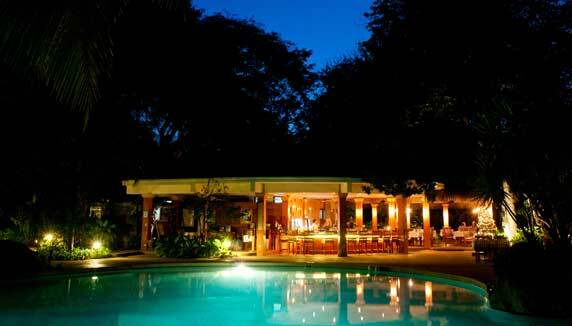 The terrace as well as the balcony are ideal for romantic candle light dinners. The ground floor suite has wide sliding glass doors that fully open in such a way that the extensive wooden terrace is incorporated into the unit. 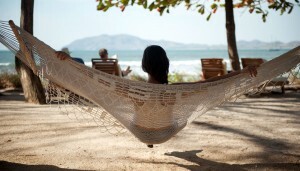 This allows for a unique ocean view and it is perfect for relaxing moments in the hammocks. The elegant bathroom offers a spacious shower. Whilst the first floor suite offers large windows, a wide balcony with a hammock and a spacious bathroom with a double sink, double jacuzzi and a shower. Beachfront Bungalows. Whilst they have the same design and facilities as the bungalows mentioned above, two of our bungalows have the privilege of being located directly in front of the beach. The ocean front terrace is ideal for a romantic, private candlelight dinner.